It’s my job to make sure supper is made for my family seven days a week. On occasion my husband will help out by barbecuing something for supper, but even then, the planning of that meal and figuring out what side dishes will go with the barbecued portion of the meal usually falls to me. Most days I work from home, so the planning and execution of dinner isn’t too difficult to manage. It’s those days when I’m working at the college, heading out the classroom door at 4:00 on my way to pick up my son from daycare by 4:30, and hoping to have dinner on the table by 5:30 when my husband gets home from work that are the real challenge. Phew. It tired me out just writing that sentence! Fortunately, I have a few tricks up my sleeve in the dinner department. There are a few meals that I like to have ready to go for those hectic days when it seems like everything has to be done and ready all at once. I rely on my crock pot a lot on the really busy days, but it’s not always necessary to use the slow cooker to make a good, quick, meal that will satisfy a carpenter’s appetite. Here are five meals that are my favorite to cook when I know I’m going to be pressed for time to make dinner for my family. Chili: My son Nate is a picky eater, but one food that he has always loved is chili. This baffles me, but I don’t question it because chili is one of few dishes that all three of us can sit down and eat together. 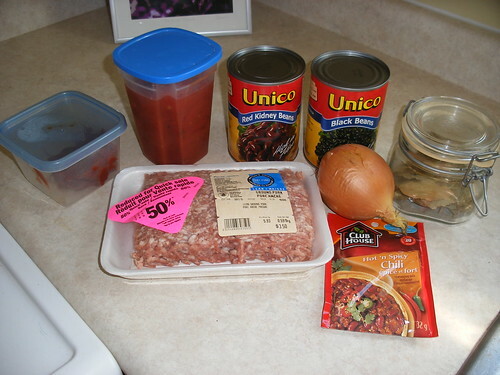 My crock post chili recipe is very easy and can be put into the crock pot in the evening and turned on first thing in the morning before heading out the door. There are so many chili variations out there. Pick one, practice it on the weekend, and make it work for you through the week. Spaghetti and Meatballs: Is there any family who does not rely on spaghetti and meatballs once in awhile when in a pinch? I buy large jars of sauce and leave frozen meatballs to simmer in that sauce in the crock pot during the day. Then all I have to do when I get home is cook the spaghetti noodles and open the wine. 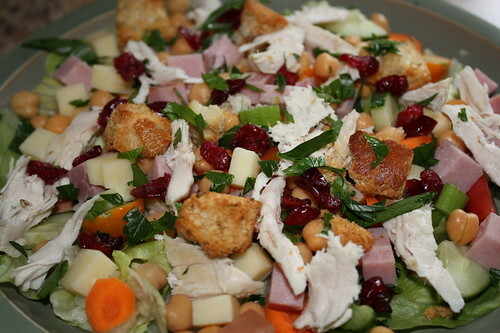 “Clean out the Fridge” Chopped Salad: For this meal, a little bit of planning is needed. The night before a busy day, I comb through the contents of my fridge for any tidbits that would make a garden salad into a deluxe, dinner-sized salad. I chop lettuce, carrots, cucumbers, tomatoes, celery and any other vegetable I find and store this in the fridge in a sealed container. Leftover roasted chicken, pork tenderloin or even cubes of leftover steak are wonderful additions that tend to please the meat-eater of the house (my husband). I also like to add things ingredients such as chick peas, black beans, dried cranberries or small chunks of cheese. When I get home from work, all I have to do is toss everything together and choose a dressing. Buffalo Chicken Sandwiches: Because we have a preschooler at home, we eat chicken fingers fairly often. Graham and I don’t care for them plain, so we toss ours in Buffalo wing sauce and throw them on a crusty bun with a slice of tomato, lettuce and a squirt of Caesar salad dressing. Sometimes I’ll serve it with raw veggies and dip, but sometimes I’ll just serve it with fries. The prep time on this meal is low and the enjoyment factor is high. Pulled Pork, Burrito-Style: This combination of foods is a new one to me, as my cousin’s wife just shared it with me last week. She told me to throw some pork chops or pork tenderloin in the crock pot with a pouch of taco seasoning, a jar of salsa, a can of black beans, an onion, some garlic powder and any other ingredient I’d like such as chopped green peppers or corn, then cook on low for at least eight hours. Then I shred the pork and stir everything all together, then serve on warm tortillas. I tried out her recommendation the day after she suggested it and the meal immediately became a new favourite of ours. What is your go-to meal for busy weeknights when you’re on the clock? I consider myself to be a “Jill of all trades”. I’ve had a lot of jobs since I began working at the age of 14. My first part-time job was as a wedding photographer’s assistant. I attended weddings with the husband of one of my eighth grade teachers who ran his own business, carrying around equipment and being his general helper. I liked fluffing out the bride’s dress before the photograph was captured. This was in the days before everyone used a digital SLR camera. The photographer was Greek and this meant we attended a lot of Greek weddings, complete with obscene amounts of food for the hired people. It was the most delicious job I’ve ever had. My next job was at McDonald’s and I loved almost every minute of it. I went from Rookie of the Month to Employee of the Month to Employee of the Year! I was an angel in a polyester uniform. Fast forward twenty years and probably dozens of jobs later, I now find myself among the many working women who hold more than one job at a time. I’ve done stints of work in several major industries, including hospitality, travel and tourism, publishing, marketing and education. According to Statistics Canada, as of 2009, 6.3% of Canadian women aged 25 to 44 held multiple jobs. The United States Department of Labor reports that in 2008 there were 3.8 million women working multiple jobs. It seems like few of us are working regular 9-5 jobs and calling it a day. 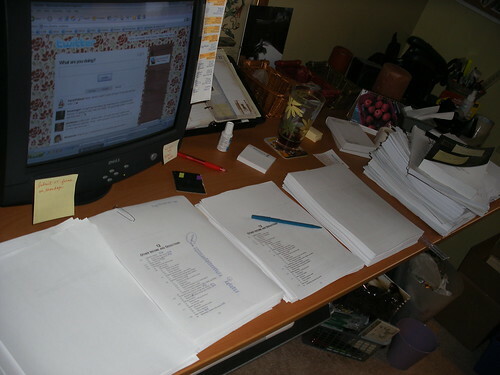 My home office back in 2007. Wait, that’s actually six gigs, isn’t it? Phew. The many small jobs I do more than equal the amount of work I’d be doing if I was working one regular full-time job, especially when you consider the work that we working moms do to maintain our homes and families, too. So yes, I do the majority of my work from a room in our house, but I’m one busy mama! Are you a multi-gig mom, too? I’d love to hear from you if you’re among the millions of women who work multiple jobs while juggling family. Categories: Parenting, Uncategorized, Working? Living? It’s late. Our room is quite dark, and now that Graham and I both use our iPhones for alarm clocks, we no longer have the red or neon blue glare of the current time in our bedroom. Our son is down the hall in his bed, coughing. I can’t let it go on any longer. I sigh, get out of bed and head down the hallway to his room, where I give him some cough medicine by the glow of his night light. “Mommy, you snuggle me?” he asks. It’s what he always asks when I end up down the hall in his room in the middle of the night. “In a minute, buddy, I’m going to get the humidifier for you,” I answer. I bring the humidifier down to the kitchen to fill it up and discover it’s two o’clock. No wonder I feel so groggy…my own cold medicine is still working in full force, making me feel fuzzy as I stand by the sink and wait for the humidifier base to fill with tap water. 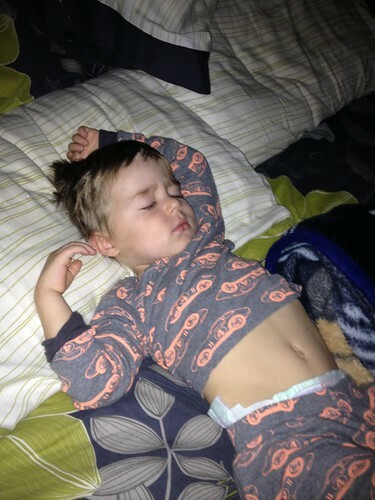 Once I get Nate settled back into bed, I lay beside him, but I’m restless. I’m restless because he’s restless. He’s wide awake, and coughing almost constantly. There’s no way I’ll get to drift off here beside him. I begin to count the seconds between coughs to keep my busy mind occupied and away from other thoughts that are invading my middle-of-the-night brain. I count to twelve between coughs and begin to feel there’s a little bit of hope that I might get some more sleep that night, after all. Finally Nate seems calm and still enough that I sneak out of his room and back to my bed. I’m not there five minutes before I hear his small footsteps come down the hallway and settle on the floor beside me. “Come on, Nate, back to your bed,” I say quietly. And there it is, the thing that creeps into my tired mind while I tend to our sick son. The need for Daddy to get his sleep always seems to trump Mommy’s in our house, especially on a week night. Graham works on a construction site all day long, so of course it is important that he is alert enough to stay safe. I know this logically but in the middle of the night it seems so unfair. I work from home most days lately, full days in front of a computer instead of on a construction site. So naturally I can get by a lot easier the day after a rough night with Nate than Graham can. It’s still hard, though, and in the middle of the night, lying down next to a coughing kid for an hour, I resent that I have obligations the next day beyond caring for our son at home. Who gets up with your kids on a week night when they are sick? Do you and your spouse take turns? I’ve given up on making New Year’s resolutions. They always seem to feel insincere; the idea that I will exercise every day or eat salad every night or floss my teeth from now on just seems like so much personal lip service. Last year is the first year that I really gave up on resolutions and instead made a list of goals for the year. Now that a year has passed, I’ve pulled out that list to see how well I did. One thing I learned about over this past year is reflection. I’ve learned the value of actively looking back over an experience and thinking about that experience to see what worked and what didn’t, then putting that reflection to use for the future. As for my list of goals for last year, there were some solid hits, and some near misses, and a few items that flew under the radar in 2012, but overall I’m proud of the things my family and I managed to accomplish last year! I completed a continuing education course during the winter semester of 2012. I wanted to finish it with a grade of at least 75% but beat that with a grade of 80%. I de-cluttered and organized the storage room in our house that we refer to as “the warehouse.” We recently picked up some shelving that was on sale and got rid of a bunch of junk and whipped that room into shape. This goal was accomplished just under the wire, on December 31, 2012. Phew! We wanted to contribute $100/month to our son’s RESP all year long. There was a snafu a few months back with the fund company we contribute to, and I didn’t make up the payments that were missed as a result. We missed three or four months of contributions. Gifts from Nate’s grandparents helped make up the difference. We’ve already got a system in place to make sure we don’t miss any contributions in 2013. I had hoped to begin making regular contributions to my RRSP last year, too, but didn’t make any. I’ve got to get going with this one in 2013. The last goal on my list read, “Finish off any home maintenance projects currently in progress but not yet complete.” Since I’m not the handyman in the family, I’m not shouldering the entire burden of this goal myself, so I don’t think I will make goals for 2013 that involve the use of power tools. Graham works hard, works often, has more than one job, and the projects around the house will get done when he has the time and energy. No biggie. All in all, there were some things to be proud of, and some things to learn from. Now it’s time to make goals for 2013. 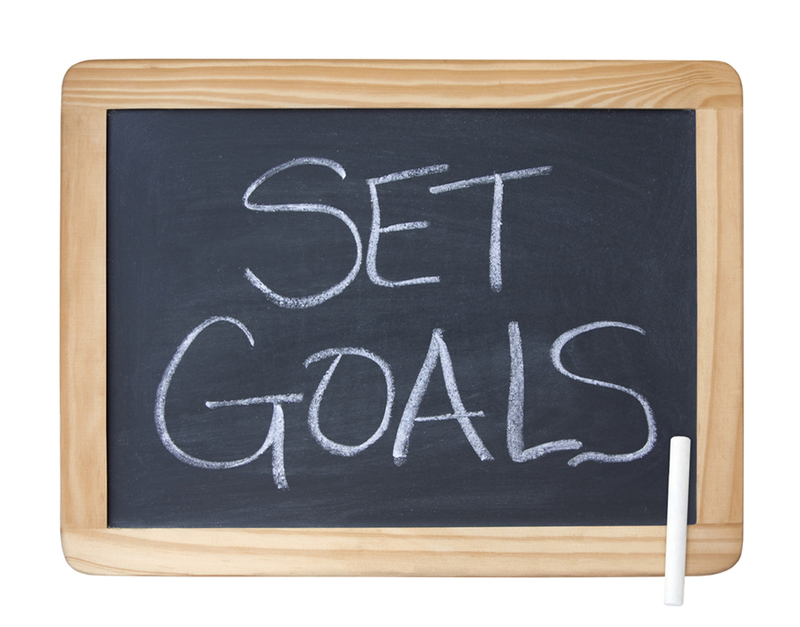 What are your family’s goals this year? I was talking about princesses with my 7-year-old daughter the other day, and the discussion turned to the idea of princesses who need to be rescued (Cinderella, for example, or Sleeping Beauty) and princesses who don’t (Disney’s revamped Rapunzel, and Merida, the red-headed heroine of the newest Disney/Pixar movie, “Brave.”) As an example of Princesses who do the rescuing, I brought up Eowyn from “Return of the King,” the last book in the “Lord of the Ring” trilogy. My mother-in-law sent this to me the other day, and the frugalista in my jumped for joy: It’s a list of clever, cheap ways to make life easier. I love finding out new ways to use the things I have lying around the house and easy ways to get more life out of the things I already have. Did you know you could use a plastic drinking straw to hull strawberries? (Just push it through the bottom and out the top — the green part your kids hate will pop off.) I tried the trick for keeping a cut apple from browning this morning when I packed my daugher’s lunch, and it worked like a charm (with no sour taste from lemon juice or citric acid). The other day, I was sitting in a corner of my local community center’s lounge, trying to finish writing an article on deadline while my daughter was in her gymnastics class. A mom and her daughter came in a few minutes after I’d settled myself into my work. She must have a child in the same gymnastics class as my daughter, because they’re there at the same time I am every week. And, every week, the same thing happens: She starts talking loudly, either to her older daughter or on her cell phone, while moving furniture around to create a space in which her daughter can do her homework. If there are books on the small table in the lounge, she dumps them on the floor with an exaggerated sigh, and then (loudly) tells her older daughter to start her homework. She glares at the two or three other people in the room if we look up from our books or our laptops. She goes through her daughter’s folder, reading comments from the teacher out loud and announcing each grade on each test. Which made me think: There should really be a set of rules posted somewhere, for people who have to work in public. For years now — decades, really — I’ve challenged myself to make the most of my money. The ability to stretch a dollar or pinch a penny can mean the difference between feeling like we “have” and feeling like we “have not” when it comes to things like groceries and birthday presents for preschoolers’ parties; being the breadwinner makes the process easier in some instances (I know exactly how much money is coming in and going out) and harder in others (I know exactly how much money is coming in and going on). I’ve found that, for my family, the most straight-forward and simple money-saving tricks work but, at some point, “just spend less money” or “cut out the things you don’t use” isn’t helpful advice. How do you spend less money when you’re spending it on essentials, like childcare when you work full time? What if you can’t cut out cable because you need to have high-speed internet access for your job? Once again, we’re in the thick of cold and flu season. And, once again, millions of parents are eying their sick days and wondering if they can really take any of them, even though they know they should stay out of the office when they’re sick. Eighty percent of common infections can be spread through the air, water, food, and via contact with contaminated surfaces, Peter Sheldon, vice president of the commercial cleaning company Coverall, told me. And the places where people are most likely to pick up germs aren’t as obvious as you might think. A good friend once told me that she thinks it’s hilarious that I write about work-life balance when I have so little of it myself. I tell them that I really write about juggling work and life, my full-time career and full-on family, which means that when it comes to balance, I’m the fulcrum on which it rests, not the one who actually achieves it.